Padraig Kelly (seated left) in 1985. 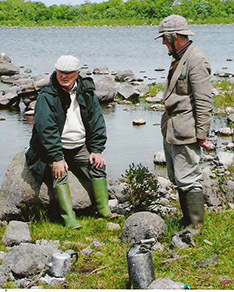 Standing beside him is Martin Cawley, another well know angling guide on Lough Conn, County Mayo, Ireland. 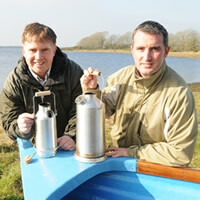 Patrick & Seamus took over the helm of the Kelly Kettle Company in 2005 and brought their respective Commercial Banking & International Marketing experiences to bear on the business. We quickly developed the Pot-Support & Medium 'Scout' Kettle - both in aluminium. As a very small family business that was pretty stagnant, we felt it was vital to obtain feedback from our customers to see what products they really wanted. It quickly became apparent that demand internationally for aluminium product was dropping fast! Aluminium cookware really was going out of fashion at an alarming rate. Instead, we saw an increasing demand for Stainless Steel items, particularly in countries like the U.K., Germany, Japan, U.S.A. and Canada. Now with neither the tradition, expertise, nor tooling (no funds to buy the tooling either!) to make steel kettles, we were faced with tough decisions. Either watch as demand for aluminium products continued to drop, or 'bite the bullet', remortgage our homes and invest heavily in the business and try and produce steel kettles. Thankfully, we went with the second option. After significant investment, lots of searching and trial & error, we were finally able to produce our first Stainless Steel 'Base Camp' Kettle which proved hugely popular and in truth, probably saved the 'Kelly Kettle' business from extinction. Stainless Steel Cook Sets and a steel version of our pot-support followed soon after as we moved away from Aluminium accessories. All three sizes of our kettles are now available in Stainless Steel as well as Aluminium. In summer 2014 we launched a stainless steel Hobo Stove accessory to allow easy cooking over the fire bases of our kettles. Also launched was a high quality stainless steel Camping Cup set with popular features. Recently we have added a steel Camping Plate set, a new 'Ultimate-Kit Value Deal offer and a Whistle for our larger kettles ('Base Camp' & 'Scout' models) which sounds off when the water boils. We have numerous other products (all camping quipment) in the development stage and look forward to bringing you some of these during 2018. 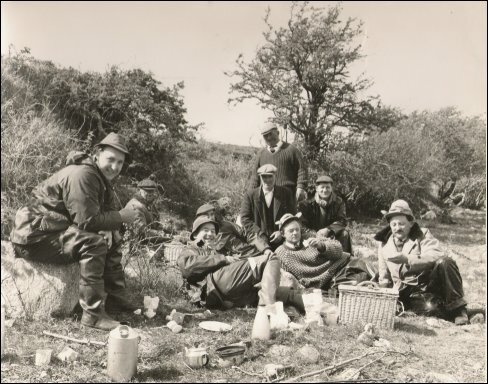 To this day, the Kelly family still provide a Boat Hire & Ghillie service on Lough Conn, Co. Mayo. Visiting anglers are as intrigued today as they were some hundred years ago with the speed at which the water can be boiled. Through word of mouth, these anglers have spread word about the kettles worldwide. To this day, the Kelly Kettle is still the centerpiece in any campsite. If you have seen one in action, you will understand why! Increasingly gaining in popularity, our company now sells our Kettles all over the world from the USA, Canada, UK, Scandinavia, the Netherlands, Germany, Russia and as far away as Japan, South Africa, South Korea & Australia. Once exclusively used by anglers, Kelly Kettles are now seen as essential piece of camping equipment and are been used by all types of outdoor enthusiasts such as explorers, Kayakers, hill walkers, Car Campers, Scouts, Hunters, Gardeners or as a vital item in emergency preparedness & wilderness survival kits.